This month we are celebrating Anālayo’s Satipaṭṭhāna: The Direct Path to Realization in the run-up to the release of its companion volume, Perspectives on Satipaṭṭhāna, in January. 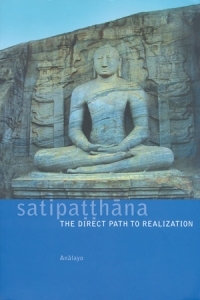 In his introduction to Perspectives on Satipaṭṭhāna, Anālayo suggests that ideally the two books are read together: “A basic familiarity with what I covered in my earlier study is needed to contextualize what I discuss in the present monograph.” So if you haven’t got round to reading the first book yet, this would be a good time! “With painstaking thoroughness, Ven. Anālayo marshals the suttas of the Pali canon, works of modem scholarship, and the teachings of present-day meditation masters to make the rich implications of the Satipaṭṭhāna Sutta, so concise in the original, clear to contemporary students of the Dharma.